1. By a tremendous margin, Millennials are commanding the attention of retailers and their marketing budgets (60%), followed by Gen-X (30%). 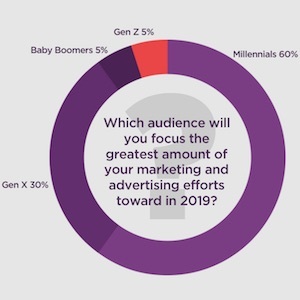 Neither Boomers nor Gen-Z are of much consequence as marketing targets. 2. Overwhelmingly (87%), retailers believe it’s not just ok, but important to take a stand on social issues. 3. Mobile offers and discounts lead the way for retailer growth strategies. 4. Speaker shopping (i.e. Alexa), while nascent now, will be very important in the future. 5. More than price, selection and free shipping drive consumers to Amazon. For retailers as a whole, Millennials and Gen-X (now age 42-54) command the majority of their marketing focus. But for jewelers, Boomers and Gen-X are more important, as evidenced by The Centurion 2018 Holiday Sales Success Index, where a staggering 87.5% said the majority of their customers during the 2018 holiday season were over age 40. 6. Try-before-you-buy incentivizes more than one-third of consumers, and retailers are taking note. 7. Mobile and social are the priority for retailer marketing investments. Non-mobile digital and offline have declined sharply as a share of marketing investment wallet since 2017. 8. Consumer interest in subscription services (i.e. StitchFix, Blue Apron) are growing. While only at 16% market penetration now, those who do use them are often heavy users and more than one-third of consumer respondents plan to try one. 9. Only one-third of Millennials have made a purchase via social media advertising. But another 10% are interested. 10. Consumers are interested in automated deal-finders (like RetailMeNot’s Genie partnership for retailers) that immediately show up in their online shopping cart. Separately, other research from RetailMeNot identifies the “household enthusiast” as a key shopper that retailers shouldn’t ignore. Irrespective of age, income, or gender, this cross-generational target carries the bulk of buying power within the household—and after “family necessities (i.e. groceries), the most popular spending category for this cohort is “style staples,” including clothing, accessories, jewelry, and health/beauty. See more here.